The author had his first real taste of nature and the natural world when he was sent aged 9 to the YMCA Camp Carson, in the beautiful Appalachian Mountains. At first he missed his mum and dad, however, before long, it was the wildness and natural world of Camp Carson he craved when back home. He loved being amongst the natural world, discovered a fascination for it — especially snakes. With this came, a deeper understanding of God’s work in giving us the wonderful natural world, which is all around us. After a successful career as a singer/songwriter/entertainer for over twenty years, burnt out and tired of the Nashville scene, his marriage in tatters, he cancelled his remaining shows. A broken man, at the age of 41, in desperation, while others would have started on the way to ruin, he remembered those years he had spent at camp in childhood, and the love he had of camping. Searching for answers and with only a tent and other essentials provided by a friend, he set off in his jeep into the swamps of South Central Florida. Alone with his thoughts, he began to ask God for guidance and became one with nature. He learned how to trap and sell snakes, surviving by his skills, he was beginning to find inner peace. It was the offer of work by another friend who managed the famous Okefenokee Swamp Park near Waycross in Georgia which was to take him onto the next stage of his life. The great Okefenokee Swamp is in the south east of Georgia. It is not really a swamp and contains many small islands. Covering about seven hundred and fifty square miles, it is a large designated wilderness area east of the Mississippi River, and is an area of outstanding natural beauty, with all its wildlife protected by law. Heaven indeed, and the place which the author would call home for the next nine years. And what an interesting nine years they were. Through the vividly descriptive writing of this talented man, we the readers are treated to some amazing stories and observations about the animals who live with, and around him. We discover how he befriends the abandoned dog, who is to become his canine companion Swampy before he moved to the park in South Central Florida, and how the next day Swampy appeared in the jeep ready to go with him on the adventure to his new home. Indeed, it is Swampy who finds the little calico kitten Skeeter, who becomes part of their small family, in the picnic area of the park. However, we also learn through these tales of the animals, which are truly wild and live alongside him, and through his example realize that their territory is not automatically ours to walk over and claim. As he says, true wild animals are born to be self-reliant and self-sufficient; it is the way God intended them to be. I loved the way that throughout this amazing book the emphasis is on understanding nature, living with it, respecting it, and recognizing that the creatures around us have just as much right to be on this earth as we do. There is so much to learn at the turn of every page, and even more if you read between the lines and take away from it the understanding that the natural world is out there for all to enjoy. However, in the natural world there is also cruelty, and the author doesn’t hide this side from his readers; after all, ‘nature is not cruel, it is just sublimely indifferent’ as anyone with a pet cat will tell you. 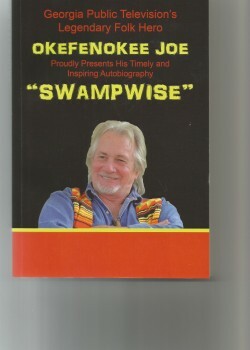 After over nine years at the Okefenokee Swamp Park, ‘Okefenokee Joe’ as he had become known decided to spread the word, and for over four decades he has done just that. He has delivered his “Earth Day Every Day” message to school children of all ages, bringing along with him a selection of native venomous and non-venomous snakes, to help as visual aids, and in teaching the children to be ‘swampwise.’ He has written, recorded and sang songs praising all God’s creations, and now he has written this truly amazing book, and I for one am in total awe of what this man has achieved.